A trip to Disneyland is on just about every child’s wish list. It is a time to ride fun rides, see Disney characters and eat things that are in the shape of Mickey Mouse. For parents, a the thought of planning a trip to Disneyland can be overwhelming. There is so much to think about and sometime it creates so much anxiety that the vacation loses some of that magic! Here at Disney Insider Tips, we want to take some of guess work out of the vacation planning part of your Disneyland vacation. 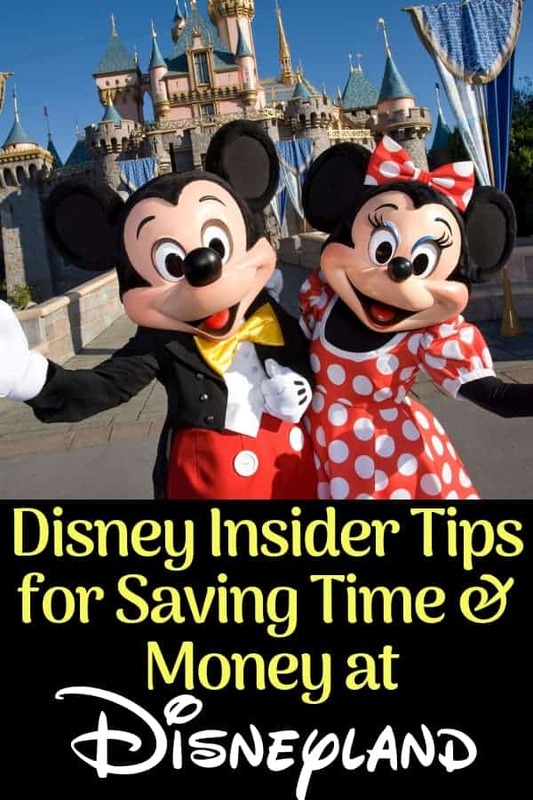 If you are looking for Disneyland Tips for saving money & time, we have a few you should know about! First thing you need to know is that you should purchase your Disneyland Ticket(s) in advance from a reputable Disney Ticket Seller. You don’t want to waste time standing in a ticket line at the park. You are going to find that the longer you go to Disneyland, the cheaper the ticket price will be per day. And if you stay on Disneyland property and book a Disneyland package, you will save even more. If you are ready to book a Disneyland vacation, be sure to check out Get Away Today! You can take an additional $10 discount off your Southern California vacation package when you use our exclusive promo code INSIDER . Insider Tip: Once you have your ticket, take a photo of the back of your ticket with your phone. If you were to lose your ticket, this is the only way to be able to trace it. Guest Relations can replace any lost ticket if they have the right information. The best way to save money on food at Disneyland is by bringing your own drinks & snacks. Disneyland allows you to bring food and drinks into the park (no glass and no alcohol). We love to pack a small cooler of water bottles and a backpack with individual snacks. This will save you a ton of money and allow you to spend your vacation fund on things you really want. Get your FREE Button. If you are celebrating a special occasion or if it is your first time at the park, you will want to make sure that you get your FREE Disneyland Button that commemorates the occasion. Wear it with pride all day long and take advantage of the extra attention it gets you. By far the cheapest souvenir you can buy at Disneyland are Disney Pressed Pennies. These pennies feature popular Disney Characters, rides and attractions. Each is .51 so be sure to have both quarters and pennies for the machines. You will want to make sure that you get to Disneyland when it opens. This will allow you to get to be one of the first to ride the rides allowing you to avoid the longer lines that grow throughout the day. If you are staying on Disney Property, you will be able to take advantage of Extra Magic Morning and Extra Magic Hours. This is a time when only Disneyland resort guests can enter the park. Use the FastPass system in Disneyland. For those unfamiliar with the Fastpass system, this is a way for you to “Jump the line” so to speak for certain rides & attractions. Look for a Fastpass distribution kiosk where you can get a Fastpass ticket for whichever ride you choose (you can find a list of Fastpass rides on your Disneyland Park Map). You will need your park ticket to be able to get the Fastpass ticket. Once you scan your ticket, your FastPass ticket will print. It will tell you the time window you have to actually ride your chosen ride and all you have to do is show up with your Fastpass during the time frame given. Everyone wants the chance to taste the popular Disney treat so the lines can get REALLY long. Don’t waste time standing in line when you can order your tasty treat on the Disneyland Park App with Disneyland Mobile Ordering. Just place your order and pick it up when it’s ready. One of the best way to meet a lot of characters at one time is with a Disney character meal. Plaza Inn serves breakfast daily & is located inside Disneyland Park, off Main Street near Tomorrowland. It offers the largest selection of characters you can meet in one place while also enjoying a meal. We hope that these Disneyland tips for saving money & time help you when you are planning your Disneyland vacation. Disneyland. Disney World is in Florida.